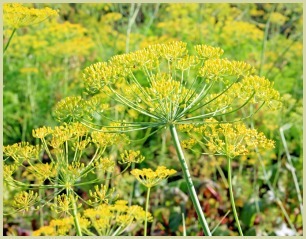 With lots of uses in the kitchen, growing dill herb (Anethum graveolens) is definitely one to think about. A quick growing herb, you can harvest the young fresh leaves 7-8 weeks after sowing. And at the end of the season you'll be able to harvest the dill seeds for use over the winter and the next years crop. General Notes: It's grown as an annual, so you'll have to start afresh each year. However, if you don't dig the plants up at the end of the season, it will self seed and you may end up with a lot more plants than you expected. And you may find out why it's appropriately known as dill weed! A sunny spot in poor well-draining sandy soil is ideal for growing dill. It can also tolerate hot and cold weather. You can start this herb from seed indoors a couple of weeks before the average last frost date in your region. Fill pots or seed plugs with a general potting compost or seed compost and place 4-5 seeds in each. Cover with a ¼ inch of compost and water. In 2-3 weeks your seeds should germinate. A temperature of 15-20°C (60-68°F) is ideal. Warmer equals faster germination. Note: Growing in seed trays is not recommended. A couple of weeks after the last frost date, thinly sow seeds in shallow drills, 18-24 inches (45-60cm) apart. Water and when germinated and big enough to handle, thin the seedlings to 8-9 inches (20-23cm) apart. If growing for the leaves, in very hot weather keep the plants well watered to stop them going to seed. Sow new seeds every 8 weeks for leaves throughout the season. In a sunny spot, this herb thrives in containers or large pots. Using a general potting compost after the last frost date, plant out any young seedlings you may have started off indoors. Alternatively sow some seeds on top of some potting compost and cover with ¼ inch more compost and water. In 50-60 days you will be able to harvest the young leaves. Keep cutting the plant back to encourage new growth, stake if necessary. Note: As it's shortlived, successive sowings in different containers every 8 weeks are recommended. I have 2 containers and I start a new crop every 8 weeks before replacing the 1st container. This way I have fresh leaves from early spring to late autumn. As it's a member of the parsley family, you may find some parsley caterpillars. Remove these by hand. You will be able to pick the young leaves 50-60 days after sowing. After the plant has flowered, chop the stalk low down and gather 5-6 flower heads. Cover with a paper bag and seal with an elastic band. Hang upside down in a warm, dry airy place, a greenhouse is ideal, for 7-10 days. After this time the seeds should drop off, but give them a quick shake if necessary. Store the seeds in an airtight jar. Early Spring: Sow seeds indoors. Spring: Plant out seedlings. Sow seeds directly into prepared bed. Summer: Sow another crop. Stake plants if needed. Autumn: Sow final crop. Harvest seeds. Winter: Dig up plants otherwise they will self seed.